Enjoy privacy and a SPECTACULAR VIEW of Sunset over the Mtns. 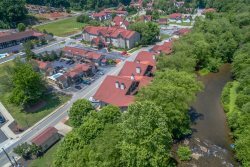 SUNRISE SUMMIT is located about 6 miles from downtown HELEN GA. Luxurious and well maintained this is a favorite among our guests. This cabin has two MASTER BEDROOMS, an indoor Jacuzzi TUB and a Hot Tub on the Back Deck just feet from the downstairs Master bedroom. You can practically step out of your bed and into the HOT TUB. The game room features a FULL SIZE POOL TABLE, a couch to relax on and a FLAT SCREEN TV for your entertainment. The living room has another BIG flat Screen TV and a WOOD FIREPLACE. The kitchen is an open floor plan so everyone feels connected. Sitting on top of the MOUNTAIN in beautiful Panorama Estates, this 2200 sq. foot cabin is available with all the comforts of home and then some. ENJOY a paved driveway all the way to the Sunrise Summit cabin with spacious parking for 3 vehicles. The mountain VIEW from the back deck will make you wish you could stay forever – the SUNRISE over the mountain is AWESOME! Located only 5 miles from HELEN GA and 6 miles to the popular Edelweiss German restaurant, this cabin is sure to please. Dist to Helen: 6 miles. Pets Allowed: Up to 2 small dogs, under 15 lb each. $50 Charge per Dog. Beautiful,Secluded, Comfortable. Close to Helen. We loved this cabin! The Jacuzzi was nice and hot when we got there. My teenagers had fun playing pool. The cabin was super cozy and private! The best part was the back porch! We spent most of our time out there. Whether it was having some coffee in the morning by the fireplace, grilling some dinner,hanging out in the Jacuzzi or just enjoying the mountain view in the rocking chairs. The team members were very responsive. I was unable to get the satellite to work and the team member on duty called back less than 3 minutes. It was a perfect get away for our family. We used the all the facilities at the property and felt at home during our stay. We will be back. Everything we needed to know was emailed to us. We called the office one time to inquire about the coffee pot and the gentleman that answered the phone was so pleasant and helpful. It was very clean and anything we needed was right in the cabin. Even with the hot tub we had plenty of towels and had all the comforts of home. It was our first trip to this area and we couldnt have asked for a more relaxing and beautiful stay. The cabin was as beautiful as the pictures and the sun rises were perfect.